After years of producing Bibles studies with teaching videos, Priority Ministries released its first stand-alone book today. 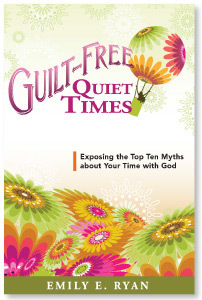 Guilt-Free Quiet Times: Exposing the Top Ten Myths about Your Time with God was written by Emily E. Ryan, Priority’s Executive Editor. Emily began researching what women were being taught about “proper” quiet times compared to what the Bible has to say about spending time with God and found that there were even more myths than the original three that Laurie mentioned. Guilt-Free Quiet Times mixes Scripture with sarcasm to help women move from the “have to” mentality of spending time with the Lord to the “get to” mentality. It also offers several pages of innovative, but practical, suggestions to foster intimacy with God and discussion questions that small groups and book clubs will find helpful. Guilt-Free Quiet Times is available in paperback for $9.99 and as a free PDF download for those subscribing to the Glo Girl Blog. A Kindle version will be available soon.